What do you think of Entrepreneurs? If you are an entrepreneur, a small or medium-size business owner, or believe that entrepreneurship must be fostered for the betterment of all, consider the Kauffman Foundation “Entrepreneur’s Pledge.” Join the list to stay informed of important issues affecting business creation. I am one of a movement of millions of entrepreneurs and innovators who made America great, and who will continue to keep our economy going … and growing. As an architects, I meet more and more homeowners who are interested in renovating or adding on to an existing home rather than seeking to sell and move or to build new. Their questions are plenty, but usually revolve around one central issue: How to I get the most out of my home improvement dollar? Assess how long you want to remain in the home. Obviously, if you are thinking of staying put to enjoy the fruits of your improvements for ten years, you will be able to make different decisions than someone interested in moving on from a fixer-upper after only one or two year. Think of this time as “emotional” or “utilization return” on your investment. This factor will also affect the life-cycle return of energy efficient improvements such as new windows or insulation. Refer to the latest numbers. Check out this Cost vs. Value 2009-2010 resource from Renovation Magazine to see how much of your money you can reasonable expect to recoup when you sell the house. There is data for various regions and metro areas across the country, so you should be able to get a good idea of a general range for typical improvements such as adding an attic bedroom, or renovating a master bathroom. The difference between cost and value is the true price tag of your improvement. Consider doing some of the work yourself. Labor can make up anywhere from 15% – 30% (or more) of the cost of a renovation job, so tackling some of the simpler items can make an impact on the overall budget. Beware, however, of taking on more than you can handle safely and economically. Frustrations, complications, and delays are always just below the surface on renovation projects. Remain sober about the economic benefit of certain changes. If you check the Cost vs. Value chart from number two above, you realize gone are the days of renovating a bathroom or kitchen and selling your house for a 20% gain in just over a year. Is that “true price tag”worth spending to get your emotional or utilization return? Ask for professional advice before undertaking a big project. As an architect and real estate agent, I am obviously a big proponent of planning and knowing the realities of your real estate market before making decisions regarding home improvements. Most professionals will be glad to give an quick opinion or consult without cost or obligation. If you like what they have to say, consider engaging them to help you with the rest of your project. Find a professional for your job at ServiceMagic.com. Overall, being realistic with your goals, expectations, budget, and abilities are all critical aspects to a home improvement. Assembling a team of professional advisers may cost a little more on the front end, but could save big bucks by steering you clear of costly mistakes. As a licensed architect, co-founder of  Architecture in New York and Chicago, and a Licensed Real Estate Salesperson and Realtor with the New York office of RealEstate.com, I bring a unique perspective to the real estate purchase process and see often opportunities where others may not. I have dedicated my professional life to learning as much as possible about the real estate market and the built environment. I am committed to sharing that knowledge with my clients through exceptional service. Architecture is ready. Are you? Looking for Chicago or Long Island Real Estate? A Fixer-Upper, or other distressed property such as foreclosed property, bank-owned property, or REO, can represent a great real estate opportunity, especially in today’s market. Of course, the potential is wrapped in risk. 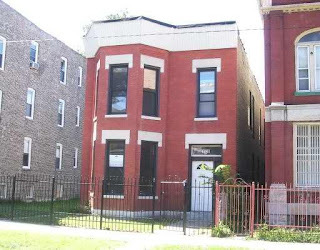 If you are an individual interested in this type of real estate investment,  and Inside the Brackets attempt here to take some of the mystery out of tackling a fixer-upper in Chicago. Some of these items were mentioned in our earlier post: What to Look for When Shopping for a Home in Chicago: From an Architect’s Perspective. This is not an exhaustive post, so feel free to contact us with questions. This might seem like it should come later in the process but for several reasons this should be the first step (except for maybe contacting us). Here’s why: Getting pre-approved by a lender (not a broker) ensures you can determine a realistic budget for your project.If the property you find is a bargain, it won’t last long. Being pre-approved will allow you to make your offer more quickly and without financing contingencies. For example, bank owned and foreclosed properties typically require the letter of pre-approval with the offer. If you don’t have one, the property could go under contract while you scramble to get financing lined up.It is smart to shop around for the best lender, and this takes time. Rushing to get an offer put together is not conducive to getting a good loan.Confirm the lender is very experienced with the type of properties you are interested in buying. Confirm that the lender will do purchase and construction loans. If you want to use FHA financing, get the requirements from your lender, and make sure you’re looking at properties that meet them. With thousands of properties on the market it is important to narrow your search criteria as much as possible. When working with a real estate agent, and utilizing the MLS, it’s pretty easy to set up very specific search criteria to narrow down your list. Doing this from the beginning will save you time. Your interests, existing skills, time available, and budget will help narrow your search. For example, decide ahead of time if you want a multi-unit building, number of units, commercial space or all residential, target neighborhoods, price-range, features, zoning (if necessary), condition of the property, etc. Can you perform the rehab work or will you hire contractors? How do you plan to use the property and what is your exit strategy? Will you live in the unit (owner occupied buildings are generally eligible for better financing options)? Will it be all rental? Will you sell it as soon as the repairs are complete? Depending on the deal that you find, your answers to the above could change. Working with a Realtor® from the beginning of your search can save time and perhaps even money. In addition to MLS searches in realtime, they can provide you with tax searches, property history and other valuable information to evaluate the property. Plus, in Illinois, the seller pays all commissions, so the buyer gets these benefits with no out of pocket expense. Once you determine your target property type, there will be many that meet these general criteria. How to determine which one deserves your offer? How much should you offer? Is the property worth what the seller is asking? Answers to these questions can be determined by property specific due diligence. The purpose of due diligence is to uncover and quantify things that affect property value. There are always additional “surprises” along the way, but the more you find ahead of closing, the safer your investment becomes. Formalize your due diligence with written charts or spread sheets. Formal due diligence will help you compare different properties in an apples-to-apples manner. Your chart, also called a pro forma, should include all hard cost and soft cost estimates, purchase price, expected rent, expected price when you sell, etc. This will help you understand the value of the property and what the monthly cash flow will look like. Have a contractor on your team to help you get a handle on potential renovation costs BEFORE you offer. Don’t be afraid to make offers that are below the ask price. It is common to make offers on 5 to 10 different properties before getting one accepted. If your first offer got accepted, it probably means you were offering too much. In most situations, it is okay to offer well below the asking price, especially in this market. If you are confident in your pro forma, the ask price is almost irrelevant. Offer what you want to pay for the property. If the seller is a bank, expect long delays in communication. They might ask you to be ready to close in 15 to 30 days and then not respond to you for two months. Just be patient. There’s no way around it, so utilize the time for additional due diligence before closing. Work with an architect to have any necessary drawings for repair ready for permit before the closing. Interviewing contractors during the closing period can allow construction to start immediately. Because of interest charges, time is expensive in real estate. The sooner you can get the building occupied the better. The key to this step is speed, unless you are planning on living in the property. If you are planning on renting your property, market to potential tenants even during renovation/construction. When tenants move in, they pay your mortgage. Until they move in, you are paying it all yourself. Consider using a rental agency to fill your vacant units. They will save you time, which as we said, is money. Being able to accurately and quickly evaluate the potential of a building is critical to making a good purchase, knowing the required team members and actions to take during closing and renovation are critical to ensuring your purchase becomes a good investment. and Jameson can help you with all of the above. Through our relationship with Jameson Real Estate, we can represent you as a buyers agent (at no cost to you) and  can help you evaluate each property for zoning and code issues that might arise or stand in the way of making the changes you want to make. Through our relationships with highly qualified contractors we can also help you get estimates for the repairs. And finally, if you would like, we can help you navigate the building permit process and execute construction. If there are any steps you have questions about, or if you would like to discuss searching for a property, please feel free to contact us. We would be happy to discuss the process further or help you start your search. Let Jameson and  make your purchase and renovation an experience that you’ll want to repeat. For additional information, see this How to Buy, Find, and Renovate a Fixer-Upper by Andrew Wilson, AIA. The Chicago Tribune recently published a great article articulating a current  investment strategy: 2-flat ownership. The 2-flat: A classic Chicago property type. Owner-occupied 2-flats, where you live in one unit and rent out the other, qualify for fantastic FHA financing. You can still get a great place with only 5% (or even 3%) down. When rental income is considered, it is possible to afford to buy in a neighborhood that would otherwise be outside of your budget. Need to move? You may not have to sell: you can rent out your unit and borrow against the ownership of the entire building. Of course, this will require you to have lived there for some time to have built equity. No condo associations. Yes, this may require a little more owner ‘proactivity,’ but that is a small price for real estate freedom. In short, 2-flats are a great way to both: 1) establish home-ownership and 2) get into the real estate market in an entrepreneurial way. Click here for some more Tribune tips. If you are interested in shopping for a 2-flat, or any type of Chicago real estate for that matter,  knows a guy who can help you out. And we might even have the place for you.